If you’re a senior or a caregiver looking for the best shoes for seniors or the elderly people to move around with, a good pair of Velcro slippers will be perfect. Velcro slippers are lightweight and normally worn indoors. This makes them the best shoes for seniors with arthritis, swollen feet, diabetes and other health conditions. Velcro slippers are fashionable and come in different types, sizes and shapes. The types include sandal slippers, closed slippers, slipper boots, evening slippers, slip-on slippers etc. The best Velcro slippers for the elderly should have excellent friction to prevent them from sliding. You do not want a senior to fall when wearing the slippers. The slippers should also comfortable, and easy to wear and remove. Velcro slippers are ultra-lightweight, comfortable and extra-wide slippers. The footwear have adjustable Velcro straps made using the loop and hook system. The slippers are pain-free, gentle on the skin and easy to wear and remove. Velcro slippers are available in different types and with various features. Some Velcro slippers are made for fashion. However there are others specifically made for the elderly whose feet swell and become painful due to health problems such as arthritis and diabetes. Most Velcro slippers serve both purposes well. Irrespective of their design, Velcro slippers are durable, washable and affordable. Why are Velcro Slippers Good for Seniors? Velcro slippers don’t have laces. Instead, they have a hook and loop strap that make them the best slippers for the elderly. Wearing these slippers saves the elderly from the stress of tying shoelaces. Tying laces can be cumbersome and, at times, dangerous. With Velcro slippers, seniors don’t have to worry about shoes with laces that can get lose e while they’re walking. The hassle of having to re-tie laces or danger of them getting trapped in something that may make the senior fall is eliminated. The feet size of most seniors changes with their age. Before buying Velcro slippers for the elderly, consider the foot size too. If you purchase the wrong size of slippers, it can be difficult to wear, making walking painful. It can also cause foot fractures. There is no better feeling like moving around in a comfortable pair of Velcro slippers. For the elderly, pick flat slippers with a sturdy build and sufficient padding. When buying slippers for seniors, especially those struggling with joint problems and obesity, go for lightweight ones. The quality of Velcro slippers you choose is very important. A good pair of slippers should be long lasting. You shouldn’t have to purchase another pair within a short time. Before purchasing Velcro slippers, pay attention to their specific features. Find out whether they are suitable for seniors. If you purchase slippers that don’t come in an appealing color, you may end up not wearing them as much as you would wear those of the color you love. Below are the best Velcro slippers for elderly men based on durability, customer opinions, brand trust and other factors. 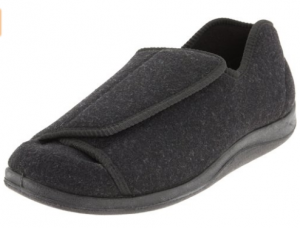 Foamtreads Men’s Doctor Slippers are light in weight, flexible and non-marking. The slippers have a 3-way secure adjustable strap that make them fit the feet well. The slippers feature a dual density rubber outsole that is 100 percent non-marking. This makes them suitable for both indoor and outdoor use. The top part of the slipper is made of 70 percent wool blend to keep your feet warm. The inside is lined with latex foam. The slipper also has a removable Anti-bacterial Nylex foot bed. The Foamtreads Men’s Doctor Charcoal Wool has many positive reviews from customers that bought them on Amazon. The slipper is rated highly for comfort and fit. The Old Friend Men’s Adjustable Strap Slipper’s design mimics the old-fashion approach of foam shoes, sheepskin slippers and massage sandals. The slippers’ straps can be opened, closed and adjusted easily. The strap doesn’t require much assistance to secure it. 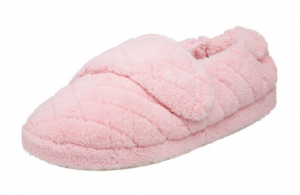 The slippers’ plush sheepskin lining keep the feet warm both outdoors and indoors. The sole is weather-tolerant and skid-resistant. Therefore, the slippers can be worn indoors and outdoors without the need to change them. The Old Friend Men’s Adjustable Strap Slipper is rated one of the best Velcro slippers for seniors on Amazon. Most customers are happy with the adjustable straps, comfort and fit of the slippers. The factors you should consider when choosing the best Velcro slippers for senior men are also the same when you want to buy slippers for elderly women. Below are the recommended Velcro slippers for senior women. The Acorn Women’s Spa Wrap Slipper is ideal for relaxation and pedicures. The slippers feature an easy slip- on design and have a plush terry cloth joined together with memory foam. The slippers have a well-cushioned contoured foot bed that offer complete comfort. Their outsoles are made of rubber for solid traction and are skid-resistant. The Acorn Spa Wrap Slippers for Women are rated the best slippers for elderly women on Amazon. The slippers have many positive reviews. Most users are happy with its comfort and anti-skid soles that ensure seniors remain in balance when walking. The Orthaheel Women’s Relax Slippers have an in-built orthaheel orthotic foot-bed that supports the wearer and reduces foot fatigue. The foot-bed is covered using 100 percent polyester terry cloth. The terry lining has an adjustable hook and loop clasp for easy wearing and removal of the slippers. 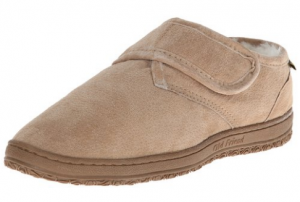 The Orthaheel Women’s Relax Slipper is also one of the recommended slippers for elderly women. The slipper is praised for its comfort, fit and durability.